When Mia, a successful novelist, is targeted by a stalker, her life begins to unravel. Unaware that the predatory psychopath has placed cameras in her home, the stalker sends untraceable emails, including photos of her and her four-year-old daughter, demanding Mia performs outlandish tasks, threatening dire consequences if she refuses or approaches the police. As the pressure builds, Adam, Mia’s sister’s boyfriend, offers to accompany her to stay in Italy with her parents. But when the villa is burnt down, Mia fears the stalker has followed her and decides to return to Wales. Meanwhile, the police are investigating the murder of three women in the area, and when DI Gravel’s daughter is threatened, he takes matters into his own hands. With his health failing and his career coming to an end, just how far will Gravel go to protect his daughter and catch a vicious killer? There is only one thing more scary than having too much knowledge and that is having too little. Mia Hamilton is a successful novelist that is being targeted by an internet stalker. A man who has only one outcome for her and that is to kill her. The killer, he has killed before, doesn’t know how yet or when, it all depends on how much pleasure he can get out of tormenting her before he gets bored. 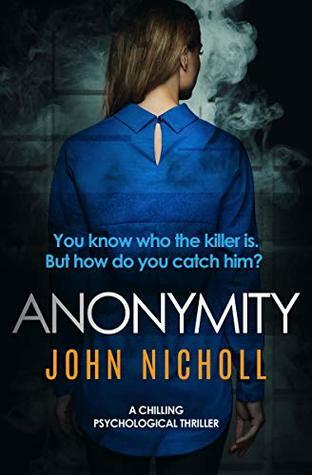 John Nicholl creates some of the most hair-raising bad guys going. Yes they are totally vicious but more than that it is the cat and mouse games that they play that make me edgy. They don’t make me jump because I am with them all the way, it is the sheer fear of all the possibilities that gets me. This guy is a professional that seems to cover every base, including her home. I am reading saying ‘don’t answer the door, don’t answer the door,’ to ‘don’t let him in.’ I am like a ghost she simply can’t hear. You know who the killer is quite early in the book, which heightens the horror even more. Mia is a lovely lady but oh so gullible, hind sight is a wonderful thing. I was made up when DI Gravel made his fourth appearance in this series but boy is he battered with life. Now a widower with failing health, a constant bad diet and drinking habit, the only thing keeping him going is the thought of returning to work, after yet another heart attack. His visit to the doctor’s is pretty funny. He gets his incentive to pull himself together when the killer makes it personal. The last third of the book is like a bucket list of this killers ultimate aims cause he really goes to work to get all his wishes in there. Oh my does this guy know how to play people. What an ending. Just speechless! I wish to thank Bloodhound Books for an e-copy of this book which I have reviewed honestly. What a pleasure it has been. Just wowed! Can’t wait to read this one! They are so creepy but thrilling!